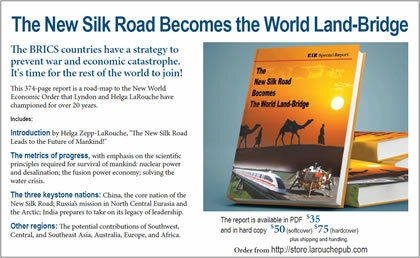 with the New Silk Road! Helga Zepp-LaRouche Responds: What Kind of Development Plan Can Stop the Global Crisis? Presentation on Transaqua by Dr. Marcello Vichi et. al. A [PDF version of this transcript] appears in the April 1, 2016 issue of Executive Intelligence Review and is re-published here with permission. 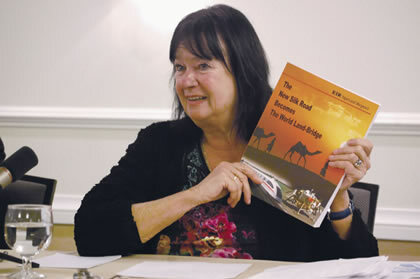 Helga Zepp-LaRouche presents the keynote address at EIR's seminar in Frankfurt, Germany, March 23, 2016. I welcome you. While this seminar is devoted to solutions to the world’s urgent problems, I must address the current dramatic threatening events very briefly. And I only want to emphasize, that while I’m touching on these different existential threats to our civilization, the solutions are within reach and depend entirely on our actions. Thus, this is not an academic seminar, but really a call to move to implement the solutions we will present over the course of the afternoon. Are we morally fit to survive? Are we intellectually able to grasp and seize the solutions which exist? Or are we doomed to continue on the present course which is heading towards disaster. First, it is necessary to correct some of the explanations being presented in the public domain for these crisis issues. Let me very briefly touch on what happened in Brussels yesterday, which obviously concerns everybody—the threat of terrorism. In response, governments are asserting that we have to give up data security, that we have to have more centralization, we have to give up freedoms. And I would counter that with the statement made by the former head of the 9/11 commission of the U.S. Senate, Sen. Bob Graham [D-FL] after the attack on Charlie Hebdo happened more than a year ago in Paris. He said that if the famous [classified] 28 pages concerning the role of Saudi Arabia in the original September 11 attack had been published, this Charlie Hebdo terrorism would not have happened. You cannot discuss what happened in Brussels and the threat of terrorism without looking at the role of Saudi Arabia and Qatar backing Wahhabi Salafism, as well as the fact that Turkey is buying oil from ISIS up to the present day, and is supporting ISIS with weapons and equipment. The spokesman of the Russian Foreign Ministry, Maria Zakharova, just said yesterday that the double standard concerning terrorism has to stop. One cannot support terrorism in one part of the globe and not expect it to appear in other parts of the globe. Now, just to give you one example, on March 15—a couple of days ago—the Saudi-led coalition bombed a marketplace in Mustaba, in the northern Yemen, which killed 120 people, including 20 children, and wounded 80. This was not mentioned at all in the Western media. These people are just as human as the people in Brussels. In light of what I have just said, the fact that the EU is putting all of its eggs in one basket, the deal with Turkey, to solve the refugee crisis is completely ludicrous. Even the former neo-con ambassadors of the United States, Eric Edelman and Morton Abramowitz, who both were ambassadors to Turkey, said that the Erdogan government does not function, that it’s an authoritarian regime, economically collapsing, and conducting civil war against its own population, namely the Kurds. The EU says that we have to solve the refugee crisis with a deal with that government, even though the UN High Commissioner already has said that the mass deportation of refugees now going on from Greece to Turkey is illegal. This proposal had already been demonstrated not to work, because the day after this agreement went into effect, 1,662 refugees landed in Greece seeking new routes and new islands, since the refugees are very afraid of being sent back into the arms of ISIS. In protest, the UN Human Rights Commission and the Doctors Without Borders have stopped working with the refugees because, they say, this approach is untenable and will not not work. The UN Human Rights Commission also said that the so-called hotspots [containment centers for refugees], which are supposed to solve the refugee crisis according to the EU, have been turned into detention camps. Families are not allowed to leave their homes, and they have de facto been turned into prisons. The United Left of Spain is pursuing a criminal suit against Spanish Prime Minister Rajoy for condoning the EU-Turkey agreement, saying this agreement provides no help to the refugees, this is deportation of human beings who have the right to be at least checked to verify whether they have the right for asylum, and you cannot simply deport them. Our [German] President Joachim Gauck is presently on a tour to China. He has brought up the issue of human rights violations in China. This would be a farce if it were not so tragic for the people who are the victims of the EU policy. President Xi Jinping announced the One Belt, One Road mutual development policy two years ago while on a visit to Kazakstan. The initiative has grown dramatically since then. 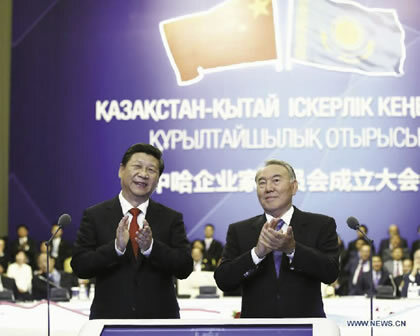 Here, President Xi Jinping (left) is standing next to his Kazakstan counterpart Nursultan Nazarbayev, during that 2013 trip. Let me just say this on China: In response to the accusations of human rights violations, China issued its own report on human rights violations in the United States, including looking into the continuous wars in the Middle East based on lies, and the drone killings, and concluding that it is ridiculous, in light of all of these types of activities, that the United States is still playing the role of the judge in the human rights case. China, in its own right, has lifted 900 million people out of poverty. In my book, they have done more for human rights than anybody who is accusing them of violating human rights, because if you look at the EU and the United States in turn, where the rate of poor people is increasing all the time—in the United States it’s 50 million and rising. One element of the new Five-Year Plan of China is to alleviate poverty in China by the year 2020, and worldwide by 2025. Now, let’s look at a second “spin” or big lie. A big story is being spread that China is responsible for the financial turmoil in the markets, that the Chinese economy is collapsing, that the New Silk Road will be a flop. China’s Premier Li Keqiang (shown here) speaking of internal improvements in the Chinese economy at the just-concluded National People’s Congress, where the 13th Five-Year Plan was presented, said the goal is to transform the Chinese economy into a knowledge-intensive one. He mentioned innovation 61 times. Now, fortunately, the lifeboat for the sinking Titanic of the European and U.S. economy is already there, provided by the New Silk Road offer of China—the “One Belt, One Road” policy. This was proposed by Xi Jinping two years ago, in Kazakhstan, and since then has taken a dramatic development. There are now over 70 nations which have expressed concrete interest to cooperate with the Silk Road and over 30 countries have signed very concrete agreements on many, many projects. The New Silk Road, for which the Schiller Institute has been campaigning for 25 years, as our answer to the collapse of the Soviet Union, is a completely different model. It’s based on what President Xi Jinping called a “win-win” policy of that countries cooperating on joint projects on the basis of mutual interest, of complete respect for the sovereignty of the other nation. China is pursuing its own interest, but it is also providing what is in the interest of the participating countries. 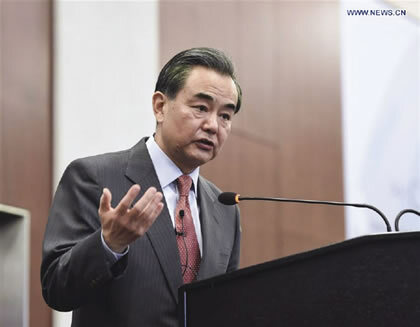 Foreign Minister Wang Yi just recently said “the New Silk Road is China’s idea, but it creates opportunities for the whole world.” And it is definitely the new model of relations among all countries. Chinese intra-Asian trade is now progressing with high growth rates. However, its relations with Europe and the United States are suffering, not because of China, but because of the economic and financial turmoil within the EU and in the United States. 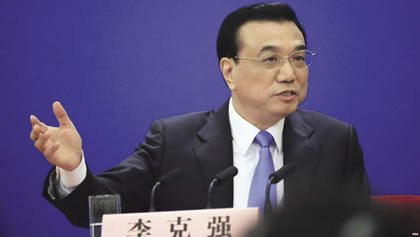 The Chinese leadership’s response to that is to turn a crisis into an opportunity, by advancing the internal Chinese economy into the next qualitative leap forward by innovating and creating new industries, upgrading the technological level of the labor force, and, at the just-concluded National People’s Congress, where they presented the 13th Five Year Plan, Prime Minister Li Keqiang used the word “innovation” 61 times in his speech. He said, the aim is to turn China from a trader of quantity to a trader of quality, to basically make it a knowledge-intensive economy. One of the export flagships of the Chinese is high-speed rail. China has built 125 km of normal railroad, but about 20,000 km of fast train railroads. They want to have 50,000 km by the year 2025, connecting every major city in China with a fast train system. High-speed rail is one of the leading exports of China. 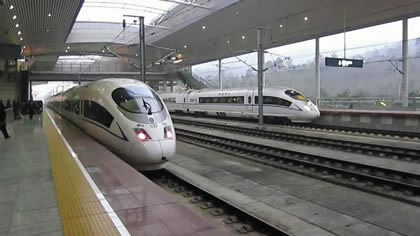 Premier Li has proposed linking all the capitals of Africa with high-speed rail. Here, bullet trains entering and leaving Shaoguan Station in Shaoguan, China. And I can tell you, I have travelled on fast trains on several occasions in China. These trains go about 310 km/hr, they are very smooth, they don’t shake, you don’t hear anything. It’s an excellent technology and it’s one of the export flagships of China. One can see how advanced the Chinese space program is, for example, by noting that next year the next lunar mission of China will go to the far side of the Moon, which means that landers and rovers will land there, something which has never before been done by mankind. The far side of the Moon will give a new window into space, because, free of the radio-wave noise from the Earth, mankind in a very concrete way can develop a much, much better understanding about what is going on in the nearby universe. Now, China is doing many, many things right, by simply doing what Germany used to do when Germany was progressing. Shang Fulin, the chairman of the China Banking Regulatory Commission, on a recent occasion said that China will from now on tax monetary speculative transactions with what you would call here a “Tobin tax”; it will promote small and medium-size industries; it will support the savings banks to give credit to these small industries which is what the German Mittelstand used to be and it is what made Germany prosperous. Premier of China’s State Council Li Keqiang said “it is the top priority of the financial sector to support the development of the real economy,” as compared, and these are now my words, to the money-printing of Mario Draghi for speculative purposes only. 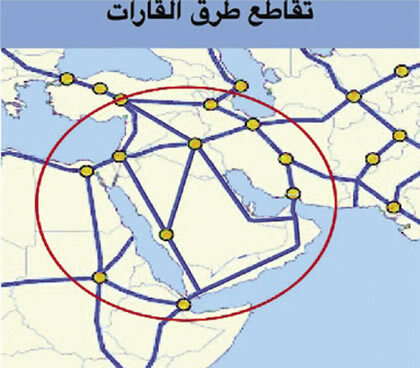 Xi Jinping: Expand the New Silk Road concept to all of Southwest Asia. Now, just two weeks or ten days ago, I just returned from a big conference in New Delhi, the Raisina Dialogue, which is going to be an annual conference organized by the Indian government. I can assure you that there, many speakers from Asian countries, acting foreign ministers, former presidents, leaders of leading institutions, all want to integrate with the One Belt, One Road policy, because they have recognized what the New Silk Road means for countries like Sri Lanka, Bangladesh, Nepal, Bhutan, Afghanistan. It means that they can import the Chinese economic development model and repeat what China did in terms of the very rapid economic development it has undergone in the last 40 years, particularly in the last 25 years. The Schiller Institute had already proposed some years ago—in 2012—that the only way you stop terrorism and stop, now in the last year, the refugee crisis, is by bringing development to Southwest Asia and to Africa. Because only if you have a comprehensive development program for those countries which have been destroyed by wars or a lack of development, as in the case of Africa, only if you apply the method of the New Silk Road to the Middle East, to Africa, can one can solve these problems. This is now on the table. President Xi Jinping visited Tehran four or five weeks ago, to present the New Silk Road. Shortly after his visit, the first Silk Road train from Yiwu, in China, arrived in Tehran, with, I think, 32 containers. Xi Jinping said that the New Silk Road is a concept to be expanded for the entire Southwest Asian region. Iranian President Rouhani immediately responded that Iran wants to cooperate. At this conference in New Delhi in which I participated, former Afghan President Karzai said Afghanistan must become the hub of the New Silk Road connecting Asia and Europe, and other leading speakers spoke along the same lines. I only mention “Marshall Plan,” not because it’s meant to be a Cold War instrument like the Marshall Plan was, but because it reminds people in Europe that you can reconstruct countries which have been destroyed by war, with economic development. That is the only way we can stop the refugee crisis, because only if you give an incentive for people to rebuild their own home countries and you give young people a perspective of hope to become a doctor, a scientist, a teacher, can you dry out terrorism. That is the concrete plan that is now on the table. Either we can get European institutions to go for this alternative, or we will crash against the wall.